We do not store mayonnaise at home as we do not often use it. However, I sometimes feel that it would be convenient if there were one in the fridge. The feeling came to me last week. It was Easter Weekend and I was making some nibbles for a platter. I just thought that something with mayonnaise flavour would add variety to the platter. And then, this idea came to me – why not using Yogurt instead! That would be much healthier! In a small bowl, mash the tuna with a fork. Add all other ingredients to the tuna. Mash and mix all together until it becomes very smooth. Season it with sea salt and black pepper to taste. Note: If you do not normally have picked onions in your pantry, you can use a small amount of capers instead. Misoni is a classic Japanese way to cook fish, simmering in miso sauce. In Japan, Mackerel (Saba in Japanese) is commonly used for Misoni. I use Salmon here because Mackerel in Australia is not as fatty as the Japanese one, and I believe that fatty fish matches this miso sauce more. I use the tail side of Salmon in this recipe. This is just because the fillet can be soaked in the sauce completely while it is simmering and it looks more authentic (as we normally use a fillet of Mackerel – flatter!). But, as long as the fish is fresh, I think that the body side of Salmon would be nice as well. The key for Misoni is a preparation for fish which is called “Shimofuri”. This is to clean fish and remove the fishy smell. When you do the preparation properly, the dish will not be fishy. Boil a general quantity of water (not included in the above ingredients). Score a cross on the surface of salmon skin. Place the salmon fillets into a large bowl. Cover the salmon with aluminium foil. Remove the foil. Add cold water to the bowl to make the water temperature right, so that you can pick the salmon up by hand. If there is any blood on the salmon, clean it in the water. Once it is cleaned, remove the salmon from the bowl and dry it with paper towel gently. In a small saucepan, combine water, cooking sake, mirin, sugar, say sauce and ginger. Bring it to boil. Make sure that the sugar is dissolved completely. Place the prepared salmon fillets in the saucepan – skin side up. Once it is boiled again, reduce heat to medium – low. Remove scum if any. Add miso to it by dissolving it gently with some of the stewing liquid. Cover it with Otoshi-buta (a drop lid)*. Simmer for 5-8 minutes. Remove the saucepan from the heat. Leave it and let it cool down for about 20 minutes**. Remove the salmon fillets from the saucepan and plate them. Put the saucepan back to the heat. Bring the remaining sauce to boil. Reduce heat to medium once it is boiled. Keep cooking the sauce until it becomes thick and shiny. It will take about 3-5 minutes. Pour the sauce over the salmon. Garnish with spring onion. Serve while it is warm. Otoshi-buta is a lid which is smaller than the dimension of the saucepan. The lid floats on top of the liquid in a pan. Otoshi-buta helps heat to be distributed and flavour to be observed into each ingredient evenly. It also assists ingredients with holding in the position, so that they can keep their shapes. Otoshi-buta is commonly made by wood, but if you do not have one, you can substitute it with aluminium foil. Cut aluminium foil that covers a saucepan that you are using. Make a circle shape by tucking the edge, so that it can be fit inside of the saucepan. Make a cross incision in the middle that will work as a vent during simmering. **This is for the flavour to penetrate into the salmon. In Japan, it is said that flavour penetrates to ingredients while they are cooling down. It is not so long ago that I started baking. I reckon it was 3 years ago. I made a New Year’s Resolution to be able to bake. I have been trying since then. So, I was so excited when I found “Secret Cake Club Perth”. This club is all about food. People who love cooking, baking and eating bring their own dishes in line with the event theme. On the day of the event, all what we do is eat! And then if there are any left-overs, we can take them home. We can share recipes and ides too. To be honest, I still feel nervous to go to the event and show my baking to the members, however, I really enjoy working on new ideas and expanding my repertoire. At the most recent event, the theme was “Quirky Christmas”. This was the 3rd event o attended to. I have not brought any cakes yet ( I does not need to be a cake, buy you know, the club’s name is…). This had to be something strange, unique and funny. I knew what to make straight away. Sushi Christmas Cake – This is the first cake I brought to the Secret Cake Club. I know this is not baking involved, but, it is Quirky enough isn’t it? Sushi itself is the adaptation from my original Chirashi Sushi recipe so the taste is guaranteed. It looks gorgeous and original. It is also quiet easy to construct. Once the Sushi Rice has cooled down and all of the other ingredients are ready, we can start contracting the cake. Place plastic wrap over the cake tin. Make sure the wrap is much bigger than the tin. 1st layer – Scrambled Egg. Place Scrambled Egg over the bottom of the tin. 2nd layer – Sushi Rice. Spread 1/3 of the Sushi Rice over the Egg. Put a little bit of water on your hands when you place he rice, so that the rice does not stick to your hands. Push the rice gently. 3rd layer – Shiitake Mushroom. Spread the chopped Shiitake over the rice. 4th layer – Sushi Rice. Spread 1/3 of the Sushi Rice over the Shiitake. Push the rice gently. 5th layer – Smokes Salmon and Avocado. Place them on the rice nicely. 6th layer – Sushi Rice. Spread the rest of the Sushi Rice over the Shiitake. Push the rice gently. Wrap over the surface with plastic wrap and rest it for 1 hour in the fridge. Take it out from the fringe. Remove the Sushi Cake from the tin by turning it upside down (just like a cake). Remove the wrap. Make a rose from Smoked Salmon. Cut a slice of Smoked Salmon lengthwise into 3. Roll the smallest slice and then loop others around. Make 3 roses. Place the roses on top of the Sushi Cake and sprinkle some Rocket Leaves round. 2 Filet of Fish you like, such as Salmon, Barramundi, Snapper, Trout etc…. 1. Sprinkle salt over Fish Filet on the both sides. Wrap them with kitchen paper tower and let them sit for at least 20 minutes. 2. Preheat oven to 200 degree. 3. Prepare the 2 pieces of baking paper. On each baking paper, place Cabbage first, and then Zucchini and Mushrooms. Place the Fish on the bed of vegetables and put Tomatoes on top of the Fish. 4. Sprinkle a pinch of salt and Dried Basil on top of the Tomatoes. Sprinkle pieces of butter over it. 5. 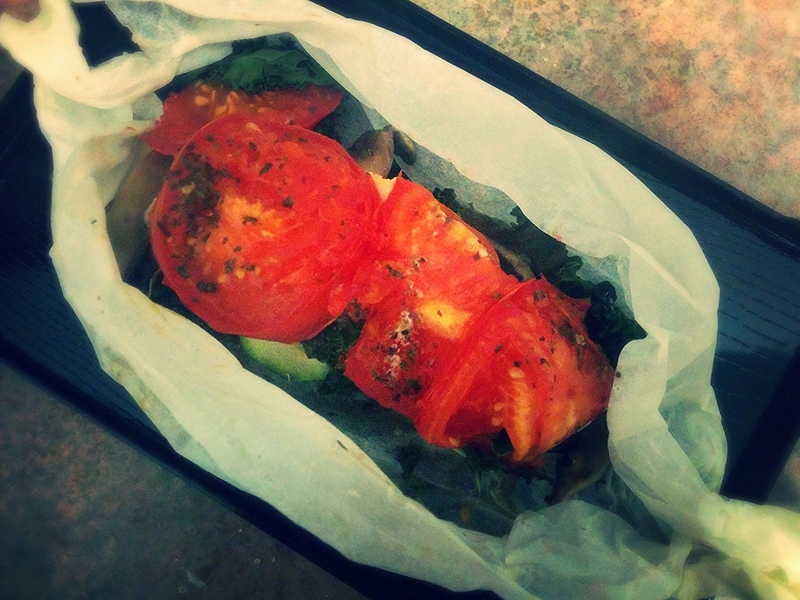 Wrap the fish with the baking paper. Fold the longer edge into the middle and twist he short edge like a candy wrap. 6. Place them onto a baking tray and bake them for 20 minutes.